Pre-order today for discounted price of $33.75! 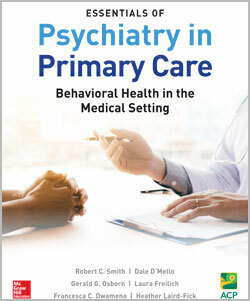 An innovative psychiatry textbook that presents behavioral disorders from the perspective of what is seen in medical settings. Looking for a specific publication? Browse the full catalog of internal medicine books in the ACP Store. This new 2nd edition of The Fenway Guide to Lesbian, Gay, Bisexual, and Transgender Health reflects clinical and social changes since the publication of the first edition. Also available in a deluxe, leatherette-bound edition. A unique volume, Osler's Bedside Library underscores that now, as in Osler's own time, selections from the humanities deserve a place on the physician's list of "required reading." Teaching in the Hospital offers a unique perspective and practical advice for hospitalists and attendings who teach on the wards. A resource for physicians interested in improving their office-based teaching techniques. The second edition has been completely updated to reflect the evolving responsibilities of hospitalists. A unique and comprehensive guide to the evalutation and management of common bone and musculoskeletal complaints. To request permission to copy or republish ACP material, visit ACP's permissions page.